Justin Long, CEO. Photo courtesy Justin Long. How can a cold, Midwestern state grow organic produce all year, while also providing fresh fish to the local community? Those are the questions Justin Long, co-founder and CEO, and Jason Fry, co-founder, asked themselves before founding Blue Lotus Aquaponics in November 2013. Before creating their company, Long and Fry did their research by traveling to a few Midwestern states and visiting places where people were experimenting with aquaculture techniques. Long wanted to dabble in aquaponics because of its sustainable, high-yield nature. And Fry’s family background in commercial farming in northern Indiana helped him to flesh out the company’s overall concept. Much of Long’s research focused on how other people are making aquaponics work in Midwestern climates. 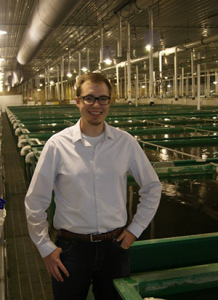 Once Long and Fry gathered research, the two made Blue Lotus Aquaponics a reality. While the company is still in a pilot phase, the co-founders are zeroing in on a final, first location for their masthead operation. “We are looking at three or four different facilities,” Long says. They are looking at the Hartford City and Blackburn County areas of Indiana. Fry was intrigued by aquaponics because of its ability to produce fresh food, and seafood all year. “The Midwest is somewhat of a food desert — it’s nutrient deprived. Many areas of the Midwest can’t produce fresh produce all year,” Long says. A lot of the Midwest’s produce is shipped in from South America, and the coastlines during winter months. During shipping, produce can lose much of its nutrient value — almost 20-30 percent, Long says. In addition to getting foods when their nutrient value is higher, the product also experiences a greater shelf life. Blue Lotus Aquaponics is focused on building the company with a focus on the local community. It wants to keep its profits “as local as possible,” as Blue Lotus will benefit the immediate community. Long also was drawn to the aquaponic model because it saves water. He explains that although water supply isn’t an issue in the region, he is looking toward the future. Long says Blue Lotus already has buyers who are committed to buying everything the company could produce. To help weigh the company’s options, Long and Fry are working with people in the aquaculture arena. The company aims to work with local butcher shops and fish processors to get its product sold in those shops. Blue Lotus’ biggest current challenge is educating Midwesterners on the benefits of seafood. Long and Fry want to see Blue Lotus grow into local, major cities, starting in Indiana, and branching out. “The idea of the model is to have a location in a major populace area supplying that area with the produce they need — fill the grocery stores with food that would otherwise need to be shipped in,” he says. “We want several Blue Lotuses rather than one centralized location.